Save 1954 topps -(reprint,reprints) to get e-mail alerts and updates on your eBay Feed. Unfollow 1954 topps -(reprint,reprints) to stop getting updates on your eBay Feed. 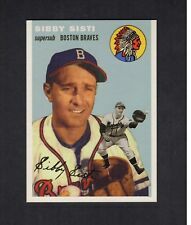 SIBBY SISTI, Braves | 1954 Topps 2006 GBSCC promotional "Cards That Never Were"
BOB FELLER, Indians | 1954 Topps 2006 GBSCC promotional "Cards That Never Were"
1954 Topps Ed Mathewes #30! Braves! No Crease! New listing 33 Different 1954 Topps Baseball Cards Higher Grade Carey Woodling Shantz Nice! 1954 Topps lot of 13 Commons--NO CREASES. Beautiful cards! !